Rose Ralston has spent her life at Miss Peabody’s School for Girls—first as a student, and then as a teacher. But with Miss Peabody’s passing, the school has been closed, the students sent away, and Rose is facing an uncertain future. 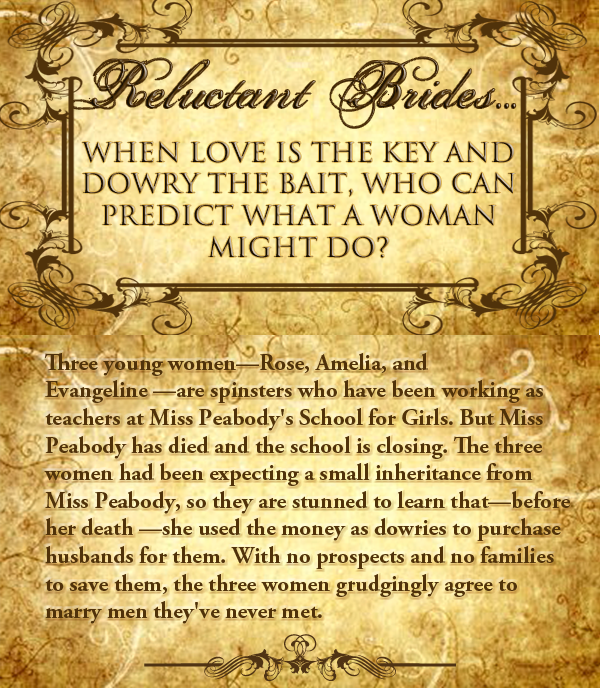 As Miss Peabody’s will is read, Rose had been told to expect a small bequest, but she’s stunned to discover that her inheritance is a dowry that’s already been paid to an elderly widower. The man is in quick need of an heir, and Rose can agree to wed or she’ll get nothing and will have no money and nowhere to go. She’s never lived on her own, and without family or friends to assist her, she’s out of options. Reluctantly, she agrees to the marriage and heads to the man’s Summerfield estate. James Talbot grew up at Summerfield. But as an orphan, his position was never exactly clear. The owner, Stanley Oswald, constantly tormented James with the secrets of his parentage. Rumors abound that he’s Stanley’s natural-born son, but the truth has been impossible to unravel. Needing to escape Stanley’s manipulations, James has spent the past decade in the army. 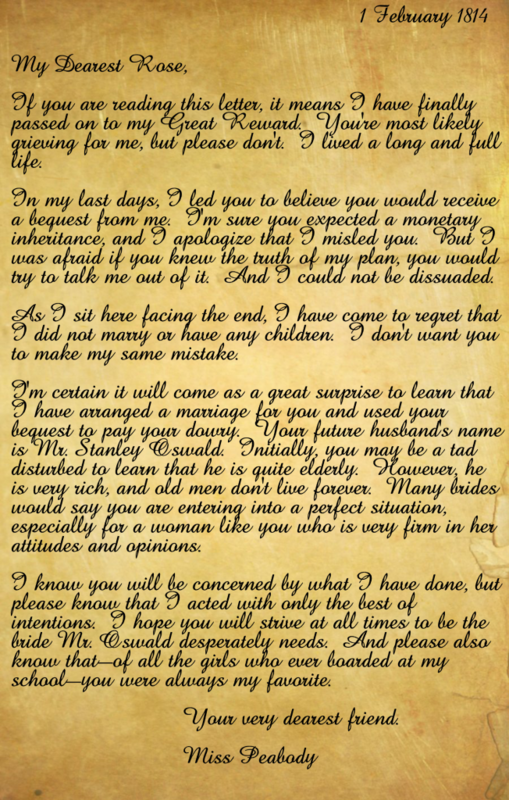 But Stanley has lured him home, and he can’t help but be intrigued to learn of Stanley’s pending marriage. He’s eager to engage in a little mischief, and nothing would give him greater pleasure than to ruin the match before it begins. At Mr. Thumberton’s announcement, Rose Ralston blanched with surprise. She’d been told to expect a bequest from poor, deceased Miss Peabody. During the woman’s final days, as her condition had deteriorated to the point of no return, she’d been very lucid. She’d been possessed of her faculties. She’d insisted Rose would receive an inheritance. Rose hadn’t wanted to seem like a vulture, circling with avarice as they’d stumbled to the end, but she’d been counting on that inheritance. She’d built up a dozen fantastic scenarios as to how she’d spend it. Yet it wasn’t likely that Mr. Thumberton would be mistaken. He was a renowned solicitor who served only the most prominent families, and for decades, he’d been Miss Peabody’s attorney and advisor. He’d handled her business affairs, drafted her contracts, and sued the double-dealing fathers who refused to pay tuition they owed for their daughters to attend Miss Peabody’s School for Girls. 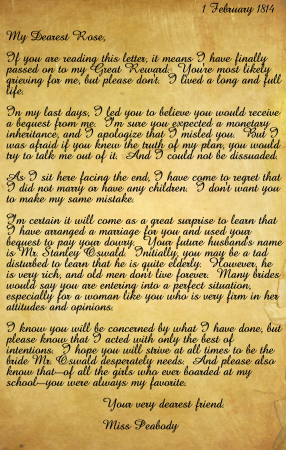 He’d written Miss Peabody’s will for her. He had to be aware of the terms. “You’re correct,” Mr. Thumberton somberly replied. Rose glanced over at her two friends, Amelia Hubbard and Evangeline Etherton. The three of them had comprised Miss Peabody’s faculty, all coming to the school as students and orphans when they were very young. They’d lived in the dormitories, had grown up playing on the beautiful, manicured grounds. As they’d completed their educations, Miss Peabody had had such faith in them that she’d kept them on as teachers. Now, at age twenty-five, they’d never resided anywhere else, had never had to establish themselves in the outside world. They weren’t even sure they had the skills to succeed elsewhere. For months, they’d been worrying over their plights and pondering what Fate held in store. Ultimately, Miss Peabody had assured them that they needn’t fret, that she’d provided for them. Her promise had eased their anxiety and tempered the sorrow they’d suffered over her passing. Though she’d never been much of a maternal figure, she was the closest thing they’d had to a mother. Stern and fair and blunt, she’d doled out guidance as well as criticism and praise when they were due. She’d done her best, and they were grateful for her tutelage. She’d never married and had no heirs. Her life had been devoted to her school, to the girls she’d taught. If anyone had been her family, it was Rose and Amelia and Evangeline. They were as near to relatives as could be found. They’d thought to pool their bequests, buy the school, and run it themselves. It was a grandiose idea, and they’d had hundreds of conversations about what they would retain, what they would alter, who would be in charge of what duties. The planning had supplied a flare of optimism during a very dark period. “She regretted the school?” Amelia inquired. “So…where does that leave us?” Rose asked. He reached into his satchel and pulled out three files filled with papers. As he handed them over, he looked abashed. “Dowries?” Rose stupidly mumbled as if she’d never heard the term before. 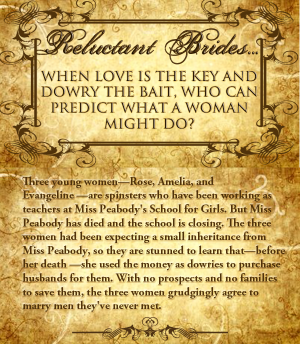 “I don’t want to…to…marry.” Evangeline hurled the word like an epithet. “She believed you should,” was his unruffled response. Rose gaped at her file, seeing her name—Rose Ralston—printed in big letters. But there was another name, too, and it swept through her with incredible unease: Stanley Oswald. Nervously, Rose peered at Amelia and Evangeline, and they were staring at her in return, their expressions demanding she do something. Of the three of them, Rose had always been their leader. “There was never any chance of that,” he said. “We could have!” Evangeline insisted. “The property was mortgaged to the hilt,” he stated. “I thought Miss Peabody owned it free and clear,” Amelia said. “She took out mortgages to stay afloat?” Rose asked. “She’s betrothed me to an old man?” Rose bristled. “Why didn’t you?” Evangeline harshly chided. Rose leaned over and patted Evangeline’s hand to calm her. Evangeline had always been excitable. Rose and Amelia liked to go along and get along. Evangeline was the one with a temper, with a spark of mischief, the one most likely to land herself in a jam. She’d never been able to accept consequences or blithely obey ridiculous commands. She argued and dissected every circumstance. “It’s not his fault, Evangeline,” Rose said. “Yet she didn’t,” Rose mused. “Lucky us,” Evangeline sarcastically retorted. “These men are strangers to us!” Evangeline wailed. She couldn’t believe it, couldn’t come to grips with the bizarre turn of events. She’d been expecting money, a bequest that would have allowed her to carry on in the same condition in which she’d muddled through for years. She’d thought they could buy the school, that they could remodel and decorate and make the place their own, but she could see now that it had been a fool’s dream, perpetrated by a trio of inexperienced, naïve ninnies. Hadn’t she secretly wished she could wed and have children? Hadn’t she secretly hoped that a dowry would magically appear? She’d never had any prospects and had no relatives who would claim her, so she’d assumed her position as a teacher was her only option. Miss Peabody had given her a different choice, had opened up a whole new opportunity. Should she refuse the gift that had been bestowed? After all, if she didn’t take the husband and the change of situation, what would she do? Mr. Thumberton had insisted she’d have nothing, and the notion of being without funds or alternatives was terrifying. “Can I ponder this for a bit?” she asked him. It seemed a reasonable request, but his reply was too, too infuriating.